Disasters—they’re always looming in the distance until they suddenly hit. Although they almost always cause damage, you can help minimize the extent on your company with a solid and thorough plan. June 1 marks the start of hurricane season, so it’s a good time to manage risks and prepare for both natural and man-made disasters. Hurricane Irma had a huge impact on businesses across the state of Florida with estimated insured losses reaching over $8.6 billion, according to the Florida Office of Insurance Regulation. 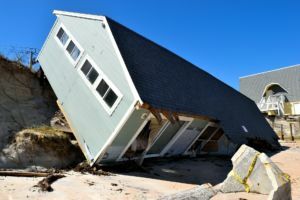 Worldwide, overall losses for businesses from natural disasters alone came to $330 billion in 2017, according to Munich Re, a reinsurance company. Your company should be taking a look at your Disaster Recovery Plan (DRP) and Business Continuity Plan (BCP) this season. As CEO, it’s important to analyze potential risks that could damage your company. Today, we’ll focus on what these plans are and their functions. The Disaster Recovery Plan is a detailed document with instructions on responding to unplanned events. The role of this plan is to help companies respond quickly to incidents to minimize lost revenues and give the businesses the best chance for survival. How often is the system (and the accounting system if stored somewhere other than the server) being backed up or copied? Are the copies that are being made stored offsite? This is especially important with older tape backup systems. Has the organization ever run a mock-restore from the backup files? If so, when was the last time this was done? What does the communication plan look like? How does the CFO plan to pass important communication plans down to subordinates? Having a good DRP will help detect issues as soon as possible, correct issues, restore functionality, and prevent what is able to be prevented. After a disaster, between 40 to 60 percent of small businesses never reopen according to the Federal Emergency Management Agency (FEMA), so it’s best to be prepared. The DRP is encompassed in the BCP, which keeps your business running despite any issues or obstacles. A good plan will help reduce the chance of a costly outage. Executive staff members often help IT administrators create the plan to help ensure the plan is regularly updated. What systems could be affected by different categories of outages/interruptions? What are key work-arounds to those systems/backup plans for them not working? What risks can increase in times of disaster? At CFO Strategic Partners, we know how to prepare for approaching hurricanes and other disasters. Although risks may start off small, there’s always potential for them to grow and gain the strength to do incredible damage to your hard work. Email us at shannon@cfosp.com or call (407) 426-8288 to discuss how to better prepare yourselves for imminent risks.